caused by a corruption tool. OMG!! a willy wars editor from you? Im not making an editor, but i managed to find most of the level data. I found out how enemy data works, the screenshot is a result of a simple hex edit. Last view: 322 days ow, but thats cool to. very nice work! Last view: 74 days What corruption tool did you use? There are dozens of corrupt editors at Zophar's and RHDN but I want the best one! And don't say you randomly put hexes in random hex offsets using hex editors. Plus I don't know if Gens or Kega Fusion have Debuggers. 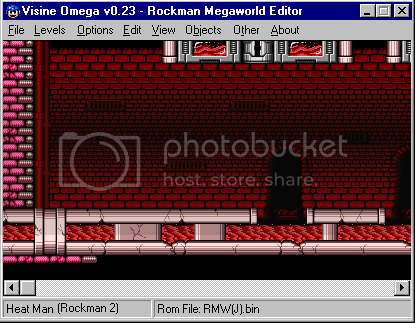 Besides, I want to edit Rockman Megaworld someday and 2 years ago, I designed a fake one. It's not my official one, but it's worth it. I just started to program the music in MM Eternity, but the problem is that the songs in hex are longer than the existing ones in-game. Is there a solution to this? Also, Matrixz, I ran the MegaFLE X Source Code through Visual Studio 2008 and it keeps saying that the project is missing a lot of files with the extension "flx". I think you forgot to include some files. Last view: 3 hours It was coded in visual basic 6, so i aint sure a newer version would be compatible with it. 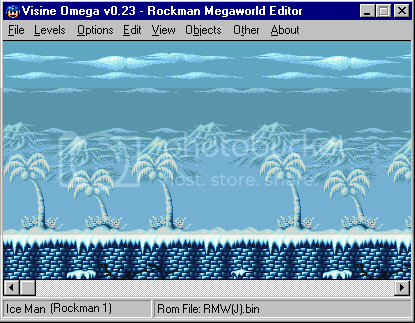 I only use the visual basic 6 myself for the custom MegaFLE level editor that goes along with megaman odyssey. and you trying to like move them somewhere else cause you made the level longer than just 3 screens ?? Well these sprites for gamma are arranged in a very spefiic order in which they come. So they MUST be in that same order all the time in order to work properly. Here's what you do. In MegaFLE go to the config options from the main window you'll find "config" at the top. click that to bring up a window with tons of options. near the bottom you'll find one called "sort enemy order by X coordinate when moving on/between screens"
Last view: 2748 days thanks for your help, kuja killer, it finally works! Last view: 74 days I don't know about this door stuff. Just to be honest, I was going to start finding/debugging data for the doors including graphical doors in Mega Man III but I didn't have time. My brother asked me so many questions regarding his Mega Man III project but he chose to discontinue with it 2 days later. Last view: 3202 days Cross-posting from Jul, out of recommendation from one of the members there. So, this is an idea I've had lingering in the back of my head for months now. I've always wanted to try to go for a ROM hack where, instead of using Mega Man, you play as one of the Robot Masters instead. The closest I've seen to this is an Elec Man hack for Mega Man 5, but I'm thinking a little bit bigger. Essentially, I'd like to make it so you play as that Robot Master with all the frills and benefits that the computer-controlled boss would have; full use of their weapon, proper sound effects, speed/jumping ability, the whole nine yards. However, I can't really contribute a whole heck of a lot to it. I can do some graphics replacement, maybe a little palette hacking using Visine or something, and perhaps permanently add in an Infinite Weapon Energy code or something so that the default is always that robot master's ability (unless the robot master is one from a different game, and in that case...yeah) or find codes to alter the speed and jump height and have it permanently put in. I just wondered if anyone would be down in joining me in this little escapade. I figure it might help bring my programming knowledge up to snuff a little, as well as just having a group to do stuff with. So, before you make a rude post, please think. It's better to have the idea on the table so those who can make it have an option to do it, rather then saw blading every idea simply as the one who thought of it could not do. If it's for Megaman 3, I can give you a little info for changing some of the data, like the hit refresh rate and the amounts of weapons and stuff. I think if you watched the hex editor in motion, you MIGHT be able to find the speed too. MySQL - queries: 92, rows: 133/0, time: 1.447 seconds.